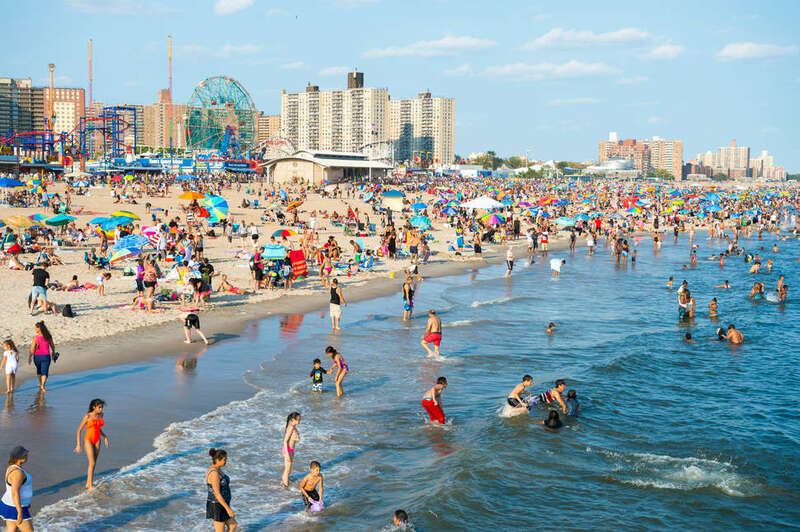 New York City has been slammed with two stifling heat waves already this summer, and we aren’t even halfway through the season. Yes, we should have seen this coming, and yes, it’s “supposed” to be hot, and yes, it seems like we were just complaining about the unending winter, but none of that makes this trip to the sun in a dragon’s mouth any more comfortable. Hopefully by now, you’ve installed your air conditioner without wreaking havoc at street level, and you’ve devised some kind of pants mitigation program. But you don’t want to be in debt to ConEd through the fall, you don’t want to let the weather dictate your fleeting free time, and your plan to spend these hot days and nights at the movies . . . may have slowed. Send that heat index straight back to the hell from whence it came with these heat-beating summer fun recommendations. Make like a bunch of adults playing teens in a 90s primetime soap opera opening credits sequence and hit the beach. We have scores of them across the five boroughs, many of which can be reached for the price of a MetroCard swipe. 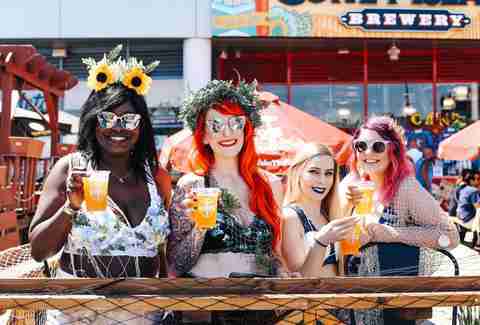 Head out to Rockaway Beach for killer tacos and booze of dubious origin, or BYO to Coney Island and try your luck at the carnival games in neighboring Luna Park. This shiny duo will give you a dose of air-conditioned nostalgia if you grew up spending summer vacations kicking around suburban malls. If you’ve already blown your discretionary luxury cash on your electric bill, give into some aspirational window shopping at Gucci, Burberry, and Hermès. Pack a lunch to nosh in the climate-controlled seating area, or swing by Hudson Eats for upscale food court bites like sushi, Cambodian sandwiches, and cupcakes. 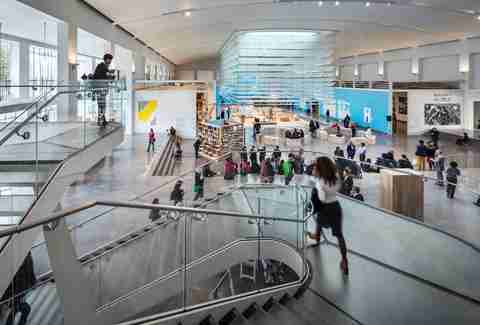 If you’ve been getting by with box fans and ice packs, maybe you can still afford the shops at The Oculus, where you’ll find more attainable retailers like H&M, Banana Republic, and Aldo. 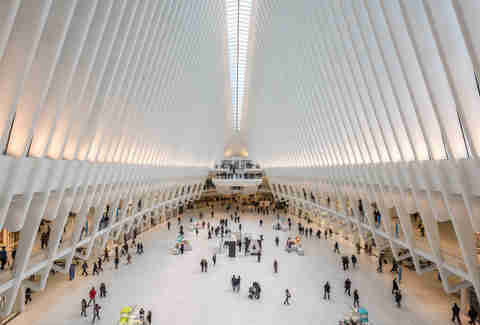 The impressive transportation hub also houses Eataly downtown, and its cafes, takeout counters, and Italian restaurants. If the sand and surf aren’t your thing, or you don’t have time to make a day of it, steal a few hours for a landlocked swim. 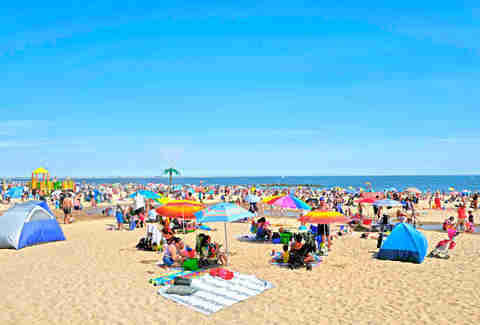 Like our area beaches, there’s an abundance of pools in NYC, some of which are free to enter. On the opposite end of the spectrum, plenty of pricy hotels and rooftop pool bars would be happy to take your money, should you need a luxe afternoon staycation. 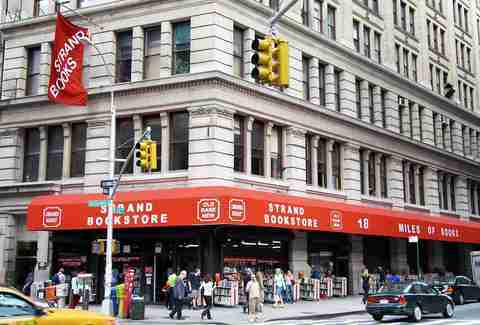 Famously home to 18 miles of books, the Strand also boasts 55,000 square feet of free A/C. Haul in your unwanted paperbacks, try your luck at the buyer’s desk, and browse the racks with your newly acquired store credit. Get lost in the basement’s records and obscure titles, sink into a cozy armchair among the rare and unique book selection, and you’ll stay cool for hours. Readings, panel discussions, and literarish speed dating events in the evening will keep you occupied ‘til close. There are dozens of breweries in New York City, so there’s a chance you won’t even have to sweat it out on the subway platform to get to one. Pick your pilsner, IPA, saison, or sour brew destination from our guide, book it to a tap room near you, and slake your summer fever with ice cold brews. Just remember that you’ll dehydrate much quicker in the heat, so sip don’t chug, and try to incorporate a little water. Midtown bistro/bar Hill and Bay hosts free Monday Night Fan Favorites Trivia in sweet, sweet air conditioning. Themed nights include "all time favorite movies" and "binge-worthy TV” as well as dedicated Harry Potter, Game of Thrones, and The Office nights. Be sure to brush up on your knowledge before going -- the winning team gets a $50 bar tab. 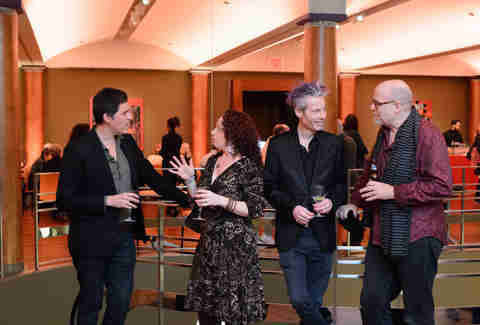 Every Friday night throughout the summer, the Rubin Museum’s ground-floor cafe turns into an A/C-filled K2 Lounge, bringing out rotating DJs, two-for-one happy hour specials on beer, wine, and well drinks, plus free access to all the galleries from 6-10pm. Swanning around a museum is the quintessential way to spend a hot summer day in NYC. Maybe it’s because of all the haunted artwork, but those joints are cold. Now you can visit some of our premier cultural institutions for free. The Culture Pass program links to your NYC library card, and enables you to book visits to otherwise spendy spots like the Brooklyn Museum, the Met, the MoMA, and the Whitney, without feeling like you have to actually get your money’s worth. Spend an afternoon perusing the 39 vendors filling Downtown Brooklyn’s new DeKalb Market Hall, including favorites like Ample Hills ice cream, Bunker Vietnamese, Fletcher’s BBQ, and Steve’s Key Lime Pie along with Katz’s second-ever deli location. Stew over your options until you can’t hold out your hunger any longer to make the most of all the free A/C surrounding you. What? Why would any reasonable person step off the steamy city streets and pay money to sit in an even steamier confined space? Because once you’re vaporized it’ll feel downright autumnal back outside. 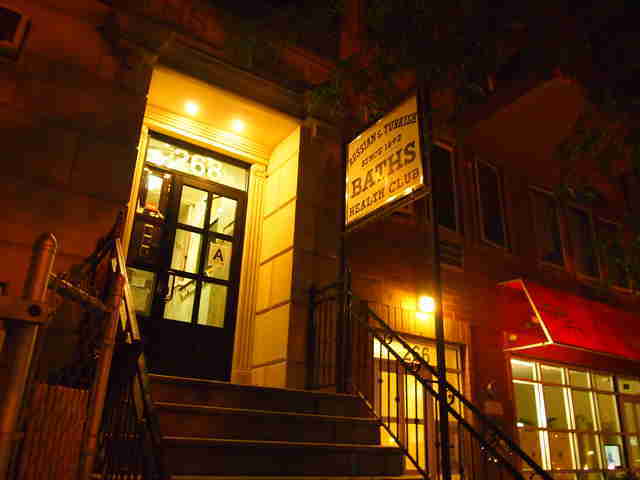 Swing by the Russian and Turkish Baths just before sundown when the temperature drops a bit for maximum effect. Can’t sleep because you’re afraid of a four-digit ConEd bill? Unplug that A/C and spend the night in the 40 degree warehouse of the New Fulton Fish Market, an experience every New Yorker should have at least once. Bundle up and walk through the fish stands to see seafood from all over the world and then stock up on frozen and fresh seafood at wholesale prices to eat throughout the summer. 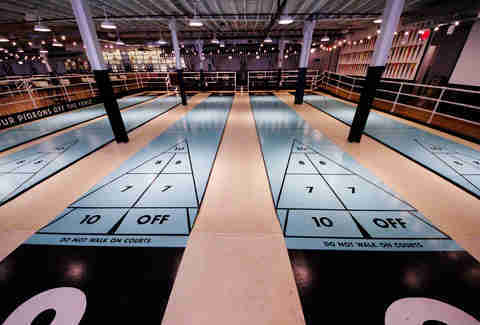 This 21+ shuffleboard club and bar is cool and dark enough to cut the thickest humidity and the brightest UV rays. Courts run $40, which shakes out to a steal when divided between you and a few of your sweatiest friends. And if shuffleboard makes you shuffle-bored, you can still enjoy the sprawling venue’s resort decor with Mai Tais and Margaritas. 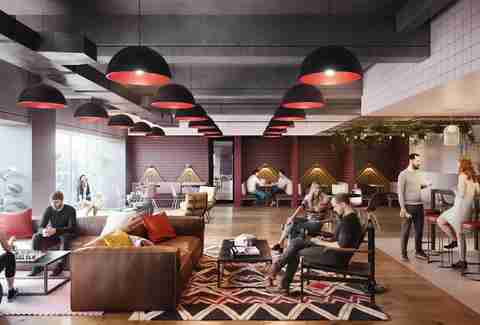 Offices are notoriously freezing, so grab a fleece blanket and register for a free guest pass to visit any New York City WeWork space at no charge. While you’re shivering, you can load up on free coffee, tea, and possibly other snacks; network with other workers (or non-workers if you’re just here to stream movies on your laptop all day); and relax in a variety of cozy spaces. Melissa is a writer based in NYC who worries about being killed by a rogue air conditioner every summer. Follow her on Twitter and Instagram.